In the winter, it can be very nice to have a warm and luxuriously soft blanket to provide extra insulation to a bed or provide a warm shawl to take around the home. Polar Fleece Blankets are known for being very cozy and warm, even when the temperature begins to dip drastically in the winter. Made of 100% spun polyester, these blankets are super soft & cozy and are very durable. Due to the polyester material used, this blanket can likely be used by anyone, regardless if they are sensitive to some materials such as animal-based textiles like wool or synthetics like nylon. With the affordable price tag of Wholesale Polar Fleece Blankets, it’s easy to purchase several blankets to use throughout a home. Whether the blankets are used in a bedroom, living room, or taken in a vehicle or on camping trips, they are sure to provide the comfort and warmth anyone in need of a new blanket is looking for. While these blankets can provide plenty of warmth, it’s nice to know that they are lightweight enough to be enjoyed year-round. Due to how durable the 100% polyester material is, and the great craftsmanship, these blankets aren't going to become torn or show wear even if used throughout the year regularly. Available in twin, queen, and king sizes, they fit any need and these blankets make fantastic gifts. The variety of colors allows the buyer to choose a blanket or several to fit the decorating scheme of any room. With colors such as tan, ivory, sage, and blue, the blankets are all quite neutral and can be a sophisticated touch to a room when draped over a sofa or bed. Purchasing several blankets in different colors makes it easy to switch them out throughout the year so that they can be enjoyed as the temperatures change and also provide a nice addition to a room that changes with the seasons. A comforter is a highly effective means of reducing your heating bills and making your bed a more comfortable place to sleep. The right comforter can add a pleasant layer of softness to any space as well as making our bedroom look even more attractive visually. Many people like to use down comforters. Down is lightweight, extremely warm and easily stored when not in use. Unfortunately, some people cannot use down comforters for a wide variety of reasons. Fortunately, there are many alternative comforters to choose from, comforters that are just as attractive and effective and warm as traditional down comforters. The white down alternative duvet comforter is one such comforter. Like many traditional down alternative comforters, this comforter is soft and silky to the touch. It offers warmth without bulk. People may sleep under it easily, feeling the right temperature even in a very cold room. Someone who is allergic to standard down comforters will find this comforter a welcome addition to their home. The comforter comes with a white duvet comforter insert. The insert has a very soft and light weight microfiber exterior that has been box stitched. This type of styling for the cover makes it an inexpensive yet highly luxurious and desirable alternative to all possible down comforters you can purchase. The duvet for the down alternative is sized to make sure that it fits over our white striped duvet covers. The down alternative comforter is available in two sizes. Buyers can purchase a single queen sized comforter. They can also buy a three pack of comforters for an additional price in case they have multiple beds in the house. The down alternative comforter also comes in a king size. The king sized version is ideal for someone with a larger bed or someone who prefers a large comforter on a smaller bed. The comforter can be purchased singly. It can also be purchased as part of a three pack if you have multiple beds in your home. Chose the right kind of comforter for your needs and you will be very happy with the results. I'm confident that this good looking choice is your path to a superior good nights sleep. Bath towels are extremely useful items. A bath towel is a highly essential thing to have in any bathroom. If you have a large house, hotel or other kinds of property, you may want to buy such towels in great quantity. The best way to buy towels in quantity is to buy them wholesale. Doing so allows you to save money and get the kind of quality you want and need for your home or any properties that you own. These executive white wholesale bath towels are created from white cloth. White is easy to clean and looks well with any decor you have in the bathroom as well as any accessories. White also makes any room look brighter and more inviting. These beautiful towels are carefully woven from the finest materials available. They are created on a shuttleless loom. This kind of technique helps create a softer, cleaner looking towel that will meet your all of your needs. The wholesale executive bath towels can be found online. New towels come feeling super soft the moment you take them out of the box! Feel the pleasant thickness of the cloth the moment you touch them. The wholesale bath towels are not expensive yet they are made from thick, pleasant 100% cotton yarns. This offers buyers incredibly superior softness and absorbency. The bath towels are also easy to wash and will resist stains even after multiple uses over time. These towels have a highly attractive dobby border that goes well with any decor in your home or any property you own. The towels are available in two different weights to meet your needs. The regular bath towel weighs 12.5 pounds per dozen and provides plush softness. The plush bath towel weighs 15 pounds per dozen. Both towel weights measure an ample 27"W x 54"L. Both of the towels are available in small bulk case packs that contain two dozen per case. These towels are perfect for anyone. Buy once and forget about them. They'll be taking care of you and your guests for a long time to come! Every kitchen needs pot holders. They're more protective than towels, these essential items shield not only hands from hot vessels but also any surface: counter tops, tables, buffets, desks, serving trays, etc. Wholesale pot holders belong in every food preparation concern: hotels, hospitals, catering establishments, restaurants, cruise ships, nursing homes, rehabilitation centers, group homes, and more. Chefs and servers alike will value the versatility of the items in this package. The oval shape is perfect for handling pots, pans, and covers, and they provide a safe resting place for hot vessels. These sturdy pot holders are able to handle heavy use, and will look and perform like new years down the road. They are available in taupe, a color that matches the versatile hand towels and dish cloths and any color scheme. At the attractive price of only $1.60 a piece, the package will fit in with every budget. And shipping is free anywhere in the United States. However, these wholesale pot holders need not be limited to use in sites where food production is carried out on a large scale. They are also useful for private homes, especially when meals are prepared for many people and special occasions. These holders are perfect for buffet dinners: placed under hot food plates, bowls, decorative pots, and other vessels, they will protect the table surface and diners alike. Everyone involved in food preparation and serving will appreciate the quality and attractiveness of the items in this package. Their taupe color blends in with every decor. What's more, the large quantity and durability of this set means that the family will never run out of pot holders. Bath time is a relaxing time. However, stepping out of the shower onto a cold floor while dripping wet can put a damper on the bathing experience. With a little extra accessorizing such as adding a new rug, this bathroom dilemma can turn into a much more comfortable, safe and positive bath experience. Designed to do just that, Spa Microfiber Bath Rugs that are Machine Washable, enrich the bathroom with style, safety and comfort. Made from 100% microfiber, these economical Spa Microfiber Bath Rugs resemble expensive, top quality cotton rugs. They are machine washable making laundering a breeze. With latex backing to prevent skids on wet bathroom floors, these plush rugs absorb drips quickly and dry fast making them the perfect choice for the bathroom. Available in neutral colors such as white and beige adds to the ease of incorporating these durable rugs into any decor. • Businesses: These rugs are perfect for hotels or rental properties . Purchasing microfiber rugs in bulk quantities at much lower prices will allow the owner to replace the rugs more frequently at less expense than standard cotton rugs. • Homes: A perfect rug for home use as they are soft, absorbent and safe to use out of the bathtub or shower. Machine Washable Spa Microfiber Bath Rugs are a great alternative when looking to replace bathroom rugs. With the durability of the microfiber fabric, these non-skid bath rugs are safe for any type of flooring. Adding fashion as well as comfort, microfiber rugs are the perfect choice when selecting bathroom rugs. Bed bugs are a common problem that unfortunately many people deal with at some point in their lives. These parasitic insects feed on the blood of humans and other animals and often live in warm homes in beds and bedding. Bed bugs can cause numerous problems such as skin rashes, allergic reactions, and they can even have psychological effects as well. Most of the time, individuals do not even know that these insects are feeding on them because they are most active at nighttime when people sleep. Before an infestation breaks out, there are ways to prevent these pesky insects from making a home out of an individual's bed. Bed bug proof mattress covers are covers that completely encase a mattress, protecting it from bed bugs, and other nuisances such as bacteria, dust mites, and perspiration. Bed bug proof mattress covers are easy to slip on. They come in different sizes and can fit on the following mattress sizes: twin, twin xl, full, full xl, queen, and king. Simply slide the cover over the mattress and zip it up. It is important to purchase a mattress cover that has been tested and proven effective at stopping bed bugs from entering the mattress. It also helps to get a cover that can easily be washed. These covers can be made from different materials, but Stretch Knit Fabric is soft, stretchable, and it can be washed in hot water. When a mattress remains uncovered, it can become at risk of a bed bug infestation. Even the cleanest homes are at risk of bed bugs, so it is important to take extra measures to prevent these insects from living in the mattress. Bed bugs cause bites that often itch, are red, and located on the face, hands, neck, or arms. It is important to recognize the signs of an infestation and tackle it before it gets out of control. If a mattress is covered and bed bugs make a home out of bed linens, this problem can be remedied by washing the bedding in the hottest water possible. A bed bug mattress cover is a way to provide peace of mind when sleeping. Frankly speaking, everyone should have such a mattress protector. Protect your mattress investment, and you and your loved ones! A mattress is an essential household item. The right mattress allows someone to get a good night's sleep. A good mattress has several characteristics including durability, enough support and one that is easy to keep clean. If you want to keep a mattress clean and make sure it lasts as long as possible, it is a good idea to buy a mattress pad. A mattress pad is an ideal way to make sure any mattress you buy lasts as long as possible. The mattress pad acts as a separate layer between the individual and the mattress. When one considers that most mattresses are in use for about eight hours a day, it is one of the most used pieces of furniture in any home. A mattress pad will help reduce that kind of wear and tear on your own mattress. 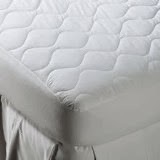 When looking for a mattress pad to purchase, it is important to keep several factors in mind. These factors include the material the mattress pad is composed of, as well as the price of the pad. Many stores offer mattress pads for sale. One can save money on a mattress pad by buying it wholesale. A wholesale mattress pad is likely to cost less, yet be just as durable, comfortable, and of high quality as any other mattress pad you chose to purchase. Another factor is the fabric used in the mattress. A blend of cotton and polyester is ideal. The cotton is soft and comfortable. Blending it with polyester makes it more durable and easier to clean. A wholesale poly/cotton fitted mattress pad is long lasting and durable. Make sure to measure your mattress carefully, as it important that it fits well. Fitted mattress pads are mattress pads that will not shift during the night as you sleep. Look for such mattress pads in a size that is the same size as your existing mattress. If you have a king sized mattress, you should buy a king sized pad etc. Also keep in mind that things like memory foam mattress toppers add to the size that must be fitted. It is best to take measurements from your own mattress and compare it with the mattress pad that you want to purchase. Look for quality, durability and a price you can afford, and you won't be disappointed. Nothing makes for a good night’s sleep like choosing health enhancing and environmentally friendly bedding. With EcoSmart Down Alternative Pillows, the comfort of shopping green and sleeping well is in arm’s reach. Its Micro Fiber Cluster filling, the latest breakthrough in bedding technology, is made from recycled plastic bottles, helping to keep them from landfills. Not only does this reduce the demand for producing new manufacturing materials, it also helps add to environmental amelioration by up-cycling waste materials into an innovative and luxurious new product. The filling and woven cotton cover are treated with ClearFresh, a USDA approved antimicrobial agent that keeps the pillows hygienic for years to come. This feature is essential for helping to reduce allergies and other ailments. This permanent protection against mildew, mold, dust and other microbes helps ensure a truly health-enhancing sleep with a reduced need for frequent washing. This decreased demand on water supplies further enhances the environmentally sound nature of these pillows. Made from recycled materials and designed to last, these pillows make for both a sound ecological and economical choice. Even without an understanding of the excellent eco-friendly design of ClearFresh EcoSmart Down Alternative Pillows, their premium comfort and softness will make any sleeper rest peacefully. As soft as down, these pillows provide a delicate loft that is not only resilient to, but is actually reinvigorated by machine washing and drying. For at least 50 cycles, the shape of these pillows is actually refreshed after a wash. Anyone accustomed to the softness but poor resilience of down will feel it's a dream come true to sleep on the everlasting comfort of down alternative pillows. Available in standard, queen and king sizes, there is sure to be just the right EcoSmart pillow for any sleeper. When discussing the quality of bed sheets, the term "thread count" is almost unavoidable. The quality of cotton sheets, an industry standard for years, is measured in thread count. How nice might it be to get away from the weight of that phrase? Microfiber hotel flat sheets are quickly becoming prominent in the bed-sheet market. In tests at one hotel in Missouri, hotel guests reflected exceedingly high satisfaction ratings when using microfiber instead of cotton. They are a less expensive and equally comfortable alternative to the sheets hotels have been using for years. The quality of microfiber sheets is consistent. Where cotton is considered "better" the higher the thread count, it also becomes more brittle with the thinner threads and less likely to withstand anything but the most gentle of uses. Microfiber sheets are soft and, given the synthetic fibers with which it is woven, they are stronger than high-count cotton sheets. Cotton sheets can also pill and scratch, especially the lower the thread count, leading to discomfort for the hotel guests. With the high usage they are expected to have in a hotel, microfiber flat sheets will be a better investment as they will not have to be replaced as often. High quality cotton sheets can invite wrinkles in the wash. The synthetic fibers of microfiber, especially when dried with a dryer sheet, can be all but entirely wrinkle-free. Less work is required to make the sheets look nice and smooth on the bed. The aesthetic quality is cleaner and more visually appealing. Microfiber sheets are also comfortable to use year-round. They are thin, and offer similar breathability to cotton sheets during the summer. Unlike other synthetic sheets, like satin, the lighter fabric gives the soft feel without the stifling air blockage. Yet they still offer enough weight to be comfortable even during the winter. When the time comes to replace the sheets in one's hotel, microfiber hotel flat sheets are the best option out there. Businesses save expense while also offering guests a comfortable and pleasing bedding option for their stay. Everyone longs for a good night's sleep. No one likes sleeping on dirty bedding. The thought of sleeping on soiled bedding can make it difficult to get the rest you deserve. It makes sense to clean your bedding regularly; this is especially true if you are having issues sleeping at night. The key to cleaning your comforter and bedspread is to do it before they become too dirty. If your items become too heavily soiled, you may have to run them through the washer more than once; it's always easier to clean them before grime gets out of control. What is the best way to wash comforter sets and bedspread? When cleaning your bedding, always check their labels. The label will let you know if there are any special washing instructions that need to be followed. This step is also the best way to keep from fading or shrinking your bedding. When washing bedding, it's a good idea to keep your washer full; a full washer means that your bedding won't be slung around and stretched out during the wash cycle. If you want to stop your bedding from fraying, always make sure that your washer is sufficiently full. Load up enough items to fill the machine; just be careful not to overfill it. When you wash your bedding, remember that your fabric may lose some of its color. The best way to avoid mismatched bedding is to wash all of your matching items at once; if the color fades, your items still match each other. When drying your bedding, you need to periodically take it out of the dryer. Large and bulky items tend to dry unevenly; if you remove them and change their position, you prevent hot spots. Hot spots damage, shrink and burn your bedding. After you finish washing your bedding, store it in a dark and dry place; this helps to prevent mold and mildew. Never store your bedding in a plastic bag; it needs to be stored in a place that promotes air circulation. There! Now you can sleep stress free on your clean sheets and comforters!